Detective Sergeant Liz Benoit of Forensic Identification Services spent five years as a Domestic Violence Coordinator at 13 Division. Despite her training, nothing could have prepared the veteran officer for the murder of a close friend five years ago. She was the victim of a murder/suicide. The parents left behind three boys. 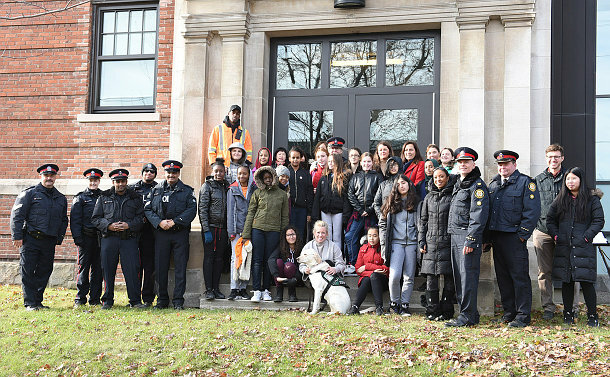 Grades seven and eight students from Carleton Village Junior & Senior Sports and Wellness Academy joined Toronto Police Superintendent Heinz Kuck and local politicians to mark the International Day for the Elimination of Violence Against Women. Beginning on that day, and concluding on December 10 which is Human Rights Day, 16 days of activism against gender-based violence are observed to end violence against women and girls around the globe. Lorelei Ecclestone, the Academy’s principal, said everyone has a responsibility to ensure women aren’t abused. “It’s time we say ‘no more’ and end violence against women,” she said. Davenport Member of Parliament Julie Dzerowicz said gender equity is among the federal government’s priorities. 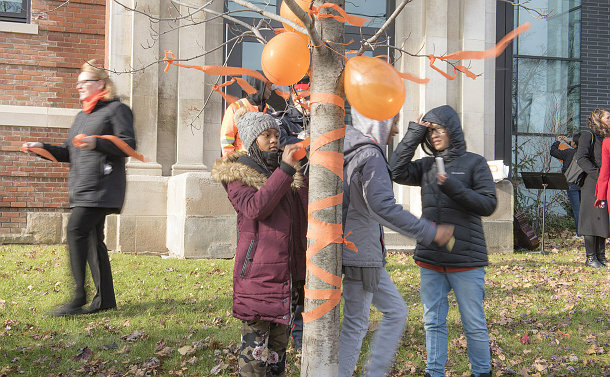 Students and officers tied orange balloons and streamers to trees on Osler St. on the east side of 11 Division station, where they will remain until December 10. 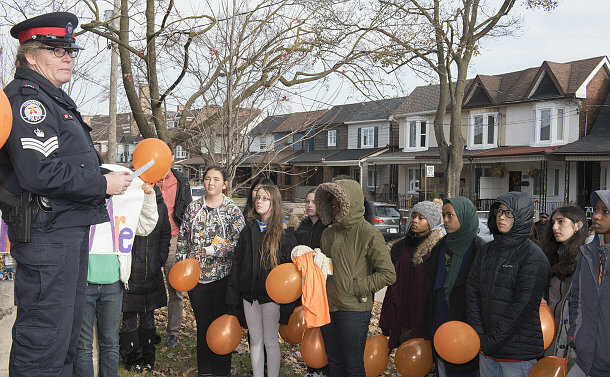 Kuck said peaceful activism is critical to let people know that violence against women and girls is unacceptable and will not be tolerated. Participants at the celebration used chalk to write messages of goodwill and hope on the Osler St. sidewalk. Deputy Mayor Ana Bailao, the Davenport councillor, also attended the event.